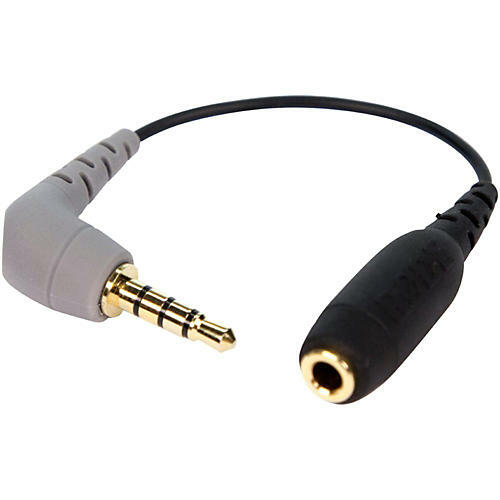 The SC4 is a high-quality shielded adaptor, designed to allow microphones with a 3.5mm output to connect to TRRS smartphones and tablets. This is ideal for users wanting to connect their R˜DE VideoMic to their iPhone, and record using the R˜DE Rec app for iOS. The gold-plated contacts are colour coded, with grey indicating the TRRS output. While the SC4 was designed to operate with Apple iOS devices such as the iPhone and iPad, it is compatible with the majority of Android devices on the market. Note that the SC4 is compatible with stereo microphones, with both left and right channels combined to a mono signal to be compatible with TRRS.